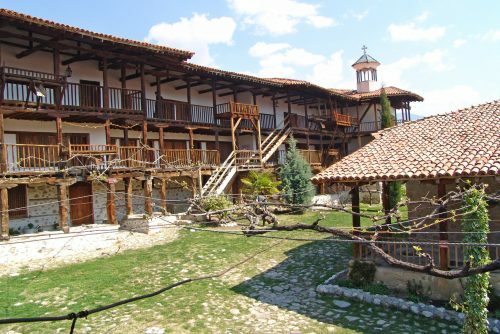 Only a few kilometers away from the town of Melnik and in the immediate vicinity of the famous Melnik Pyramids, is located one of the oldest medieval monasteries in the Pirin Mountain – the Rozhen monastery “Holy Virgin Birth”. The history of the holy cloister began long, long time ago, and that raises a number of disputes about the exact time of its establishment. According to one of the researchers, there was a monastery in this place even in the 12th century, while others’ opinion is that the monastery was established a century later. We are not specialists and we do not have our own hypothesis, so we consider the official one, according to which the monastery complex was founded at the beginning of the 13th century. We accept it, as the experts who tend towards this date, support their assertion with a correspondence found, which is a part of a Greek manuscript, in which, it is written that there was a monastery above the town of Melnik. 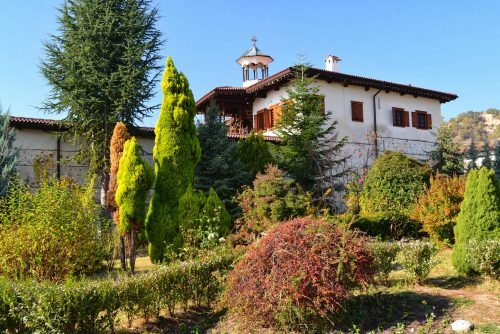 From the historical document, it becomes clear that the Rozhen Monastery existed during the rule of the despot Alexey Slav (governor of South-western Bulgaria in the 13th century) and it was a very important cultural, economic and literary centre. That was the time when, behind the walls of the monastery, educational science was carried out, books were written, and theological issues were discussed. The invasion of the Ottoman Empire in the Bulgarian lands, and especially the conquest of the Melnik region at the end of the 14th century, drastically changed the fate of the monastery complex, which sank into oblivion. For almost a century, there was no information about what happened with the sacred cloister and its fate remained unknown until 1551, when the then abbot of the monastery cloister – priest Kozma mentioned about the existence of the monastery in one of his manuscripts. In the manuscript, priest Kozma mentioned the present name of the monastery complex for the first time – “Virgin Mary Rosinotisa” (Rozhenska). So the monastery little by little came out of oblivion, and the gaps in its history started to fill. It is clear that at the beginning of the Turkish invasion, it sustained serious ruination and in the 16th century, it was restored. At that time (16th century), one of the residential buildings, the dining room, and the big church were restored and rebuilt. Approximately, during the same period, the dining room of the monastery and the church were decorated with mural-painting and frescoes. The restoration and the rise of the monastery dramatically stopped again during the 17th century, when for unknown reasons a fire broke out, which destroyed the library and a large part of the residential buildings of the cloister. From the documents found, today we know that the largest fire was after the rule of the metropolitan of Melnik Sylvester, who was а prelate from 1661 to 1667. 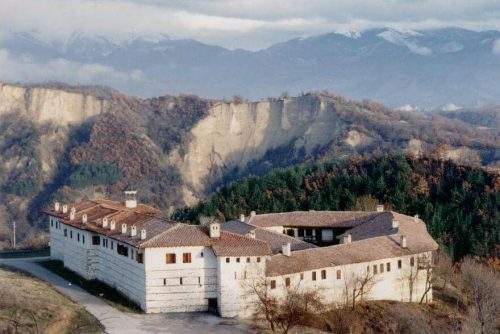 Despite the hardships and the plight in which the Rozhen monastery falls after the fire, it was restored again in the 18th century, when rich Bulgarians from the whole country were raising money and helped in its restoration. In the middle of the 18th century, the sacred cloister was already fully restored and stabilized financially and the restoration works, which were undertaken exactly during that period of time attested to that. In 1715, the main reconstruction of the monastery buildings started, and in 1732, the main church was painted with frescos again. Unfortunately, despite the apparent rise, the monastery had to go through more bad periods. Ever since the time of its founding, the Rozhen Monastery was declared stavropegial. That means, that the cloister was an autonomous and subordinate only to the Ecumenical Patriarch. That was one of the main reasons why the Turks did not raze it to the grounds, but also, that it was subordinate to the Ecumenical Patriarch, had most likely become the reason later in the 18th century, its autonomy to be withdrawn by the Greek Church. That happened in 1761, and as a reason for the withdrawal of the autonomy, the Greek Church pointed out the financial difficulties and the dependence of the Rozhen Monastery on the Iveron Monastery in Mount Athos. The management of the sacred cloister was taken over by monks of the Iveron Monastery and so the monastery turned into a cloister of the Iveron Mount Athos (Svetogorski) Monastery. Until 1912, the monastery was a cloister, and a part of the Iveron Monastery, then it became a Bulgarian one. That was not liked by the Greek clergy and was followed by years of courts which ended in 1921 in favour of Bulgaria. The monastery complex has an irregular hexagonal shape and consists of residential and farm parts, main church and ossuary. The residential parts form something like an improvised protection to the main church, which is located in the centre of the monastery complex. The church temple was built in the 16th century, but for a number of reasons that we mentioned above, it was reconstructed in the 18th century. There are no specific details about what the church looked like initially, but in its present appearance, it represents the three-apsed, three-nave, domeless building. In itself, the church is a unique architectural jewel, but what raises the visitors’ curiosity, is its internal design, and the murals in particular, with which it was painted. The earliest frescoes are from the 16th century and they decorate the narthex of the church and tell mainly about the miracles, that Christ created after the Resurrection. The scenes are painted in detail and effectively for the visitors. In the naos of the church, the paintings follow the stylistics of the Balkan paintings of the 18th century. Unlike the frescoes in the narthex, here, the works are much more diverse, and, in addition to the compositions are included the-mandatory-for-every-Christian-temple images of the Virgin Mary; also, on the most upper parts of the northern and southern walls are painted 24 stanzas of the Virgin Mary’s Akathist. In addition to the unique murals, the Iconostasis, which was made at the same time as the murals, during the church reconstruction in 1732, is also of an interest. The iconostasis was made with an exceptional finesse and craftsmanship, and the threaded interlaced work, which covers, all its embossed parts, the perfectly drawn bouquets of flowers on the plinth parts, and the gilt, carved elements, create such a large harmony, that everyone who looks at it, remains silent for a long time. One of the most valuable icons, which are kept in the Rozhen Monastery is the miraculous icon of “Holy Virgin Portaitissa“. The icon is one of the copies of the Virgin Mary miraculous icon, which was found in the sea by monks from Mount Athos. “Holy Virgin Portaitissa” was painted in 1790 by a monk from the Iveron monastery and was ordered together with a special ark. Whether the icon is really miraculous, we will not be able to say, but, there is no way we can deny the fact, that every year, on the patron’s day of the monastery (08.09), laymen from all over the country come to the Rozhen Monastery, to ask the “Holy Virgin Portaitissa” to bring them curing. Another site in the sacred cloister, that attracts the attention, is the monastery dining room. Perhaps now, you will say that there is nothing so interesting in a dining room… and you will be wrong. Because the monastery dining room in the Rozhen Monastery is one of the most interesting buildings in the monastery complex. The dining room is inbuilt in one of the monastery residential wings, but not this is the most interesting thing, but the fact that during the restoration works, specialists discovered that the room is built on thick medieval walls. The monastery dining room is a rectangular room with an apse, which was painted with fresco compositions of “The Last Supper”. The residential buildings of the monastery complex were rebuilt during two periods – in the 16th and in the 18th century. The older one of the two monastic wings is a two-storeyed building with verandahs, which surrounds the main church on the east, west, and south sides. This part of the monastery was built in the 16th century, and the monastic cells are in it, the refectory, the cellars in which the monks kept their food stocks. The monastery dining room is located in this wing as well. The second monastic wing is a three-storeyed one, and it was built in the 18th century with money donated by the Melnik craftsmen. This wing was designed for reception of the monastery guests, and on the first floor, was the cattle-shed. There is an ossuary to the monastery complex, which is worth seeing. The ossuary was built in 1597; it represents a church temple with а tomb and a place for worships. The monastery complex is situated 6 km away from the town of Melnik, and about one kilometre from the village of Rozhen. If you get to Melnik, there is no way you can lose your way, as it is the only one, and it will take you directly to the monastery gates. In front of the monastery, there is a huge meadow, where you can set a great picnic, if you wish and if you have time. If you have not planned a picnic in your program, it is good to eat in the town of Melnik, since the Rozhen monastery does not offer food and accommodation. 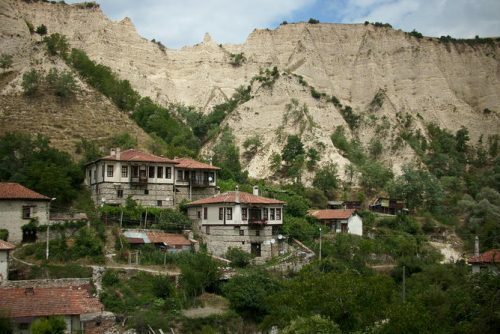 The smallest town in the country is one of the 100 national sites, and it is unthinkable to go to the Rozhen Monastery and not to take the time to view the town. In addition to the delicious food and with its famous wine (which we recommend you to try), Melnik will impress you with its National Revival architecture, with quiet cobblestone streets, and with its numerous museums. There is no way you can skip the Melnik pyramids, which rise to a height of 100 meters to the north-east of the town in the Rozhen Monastery direction. The rock formations were declared a landmark in 1960 and were listed under number 4 in the list of the 100 national sites. You can enjoy the pyramids from afar while travelling to the monastery, or view them from nearby if you take the eco-trail, which starts from the town of Melnik, passes by the Melnik pyramids, and reaches exactly in front of the gates of the Rozhen Monastery. The eco-trail is well-marked; it is suitable for children as well, and the time, for which you can pass it, is about one hour – one and a half hours.